Mitchell Trubisky #10 of the Chicago Bears points to the fans as he leaves the field after a game against the Tampa Bay Buccaneers at Soldier Field on September 30, 2018 in Chicago, Illinois. The Bears defeated the Buccaneers 48-10. Chicago Bears quarterback Mitchell Trubisky will wear a protective sleeve on his throwing arm again Sunday against the Miami Dolphins. Why change up anything when you're hot? "It definitely gave me confidence, but I think just looking back on it, it was just like any other win for the Bears," Trubisky said. "It's important. We got better that week. I felt like I got better that week in my growth and development. "I had a little cut on my arm a few weeks ago, and then it reopened in Arizona on the first drive and was just gushing everywhere," Trubisky said. "And I didn't want that to happen, and I covered it up (against Tampa Bay). "And then you play pretty well, some superstition, call it what you want. I also got a lot of threats (from fans) that I have to wear it. Yeah I'm going to keep it on. We'll see what the color is, but it feels comfortable, gives me a little more swag or whatever." Trubisky's passer rating vaulted from 77.8 to 101.6 after his big game. Until then, he'd never had more than two touchdown passes in a game. Now he's had a bye week to move on from the effort. Bears coach Matt Nagy anticipates Trubisky's head won't be turned by one week of success. "When you have a good game, it naturally gives you confidence," Nagy said. "What you have to make sure you prevent is making sure that you (don't) get complacent with that and think it's just going to happen every week, because it's not." Nagy hopes Trubisky handles it like the Chiefs' Alex Smith did last year. When Nagy was Chiefs offensive coordinator, Smith went on from a big season-opening win over New England to have a strong, steady year. "And that's a veteran quarterback that's been in the league for a long time and he knows how to handle that," Nagy said. "So I can use that to help Mitch in these situations. But the best part of all this is I don't really need to do that, because that's just who he is." "It's really impressive," tight end Trey Burton said. "It's one of the hardest things to do is focus on the next play, to not get too high or get too low on a past play. He does a great job with that and we all see it." It's one reason Nagy thinks Trubisky shrugged off his early struggles in the new Bears offense. "So he's not going to change because he had one good game, he's going to try to continue to make that a consistent process," Nagy said. "One, I think it's part of my personality, and then two, it's kind of like practice — something I've done for a really long time, really remain the same person and same emotional level throughout the games," Trubisky said. "Never get too high, never get too low, being that even-keeled guy, just trying to convey to my teammates I'm always in control." If Trubisky needs a reminder of how difficult it can be for a quarterback, he's getting it from watching game films of the Dolphins this week. "Whether it's opportunistic or skill or whether it's a combination of both, they're around the football," Nagy said. "And to have 10 interceptions in this league, three by Howard, they're a good football team, a good defense, and they make plays." 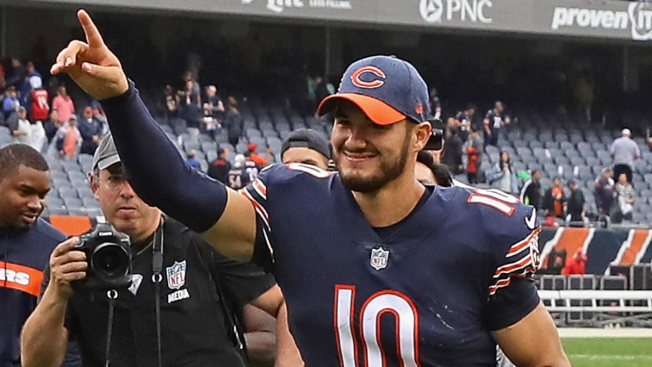 "It's a whole new, different feeling, and for those of us who were here last year, especially for myself, it's so much better coming into the building, being excited about going to work, about practicing with these guys," Trubisky said. "Even in the film room and meetings, everyone is just that much more locked-in and loves what they do and is hungry to get better week after week. "I guess that's a byproduct of winning, and it's something we just want to continue to keep going and keep growing and getting better." NOTES: Wide receiver Anthony Miller returned to full participation at practice Wednesday after missing the last game with a dislocated shoulder suffered Sept. 23 against Arizona. ... CB Prince Amukamara practiced on a limited basis after missing the Sept. 30 win over Tampa Bay. ... G Eric Kush was limited in practice due to a neck injury. ... CB Marcus Cooper missed practice due to a pulled hamstring.